FOCUS TRANSPORT: Stainless Steel Centenary marked by Loco naming. As part of the celebrations to mark the centenary of stainless steel, Bulleid Pacific 35028 Clan Line has been in operation at the Outokumpu site off Europa Link, Sheffield, for three days - Thursday, Friday and Saturday, 15/16/17th. June, hauling 4 loaded wagons (approx 450 tons) up the 1:95 gradient within the site. 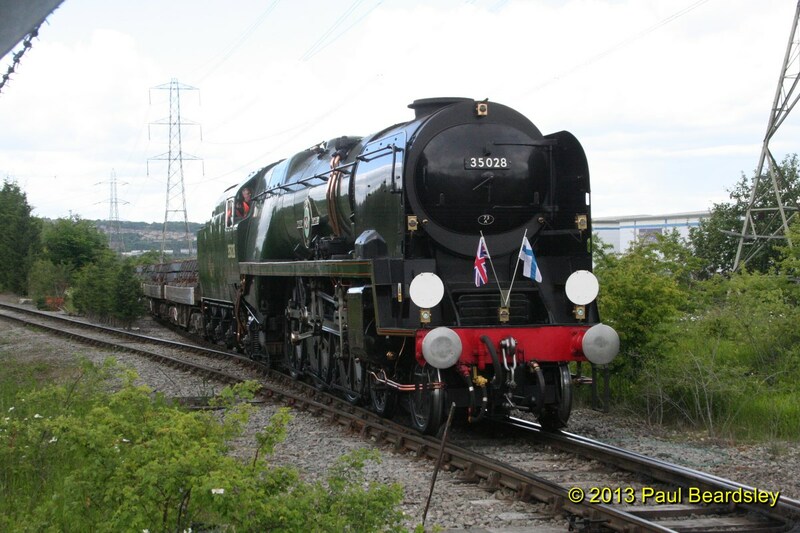 The loco arrived on site, from it's normal Stewarts Lane base, on Wednesday, 12th. 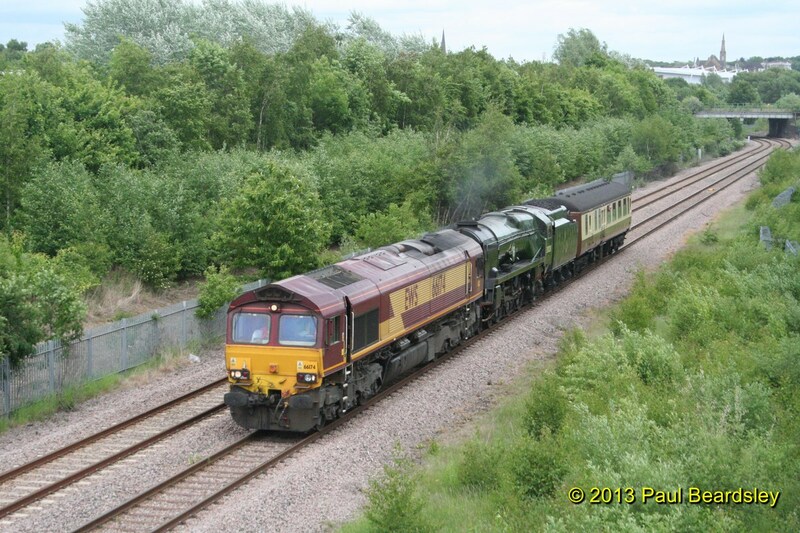 June, being hauled in light steam by 66174, as 5Z35, 0846 Stewarts Lane T&RSMD to Tinsley Sorting Sidings. It is due to return to base on Monday, 17th. June as the 0900 Tinsley Sorting Sidings to Stewarts Lane T&RSMD. 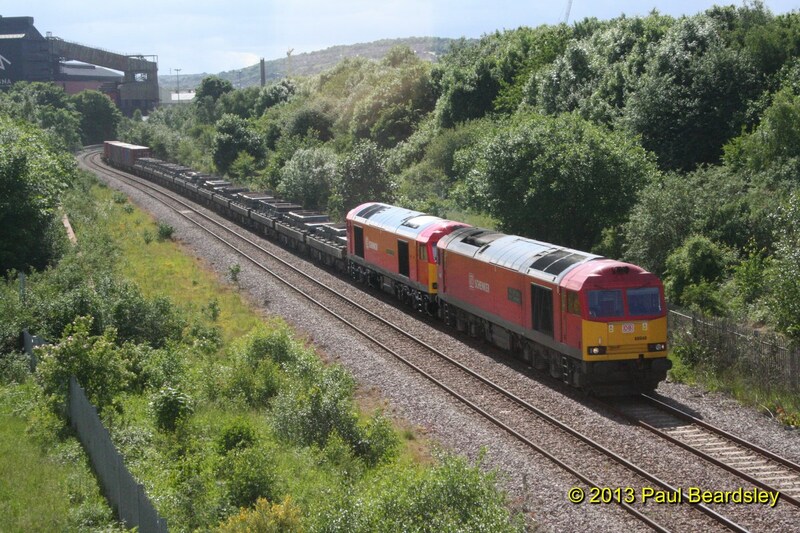 66174 hauls 35028 Clan Line and support coach past Bessemar Way, Rotherham, on 12th. June 2013. In addition to Clan Line DB Schenker 60062 has been on display from early afternoon on the Friday, 14th. June, until departing on Saturday afternoon, coupled inside 60040 The Territorial Army Centenary, in charge of 6D03, 1600 Tinsley Sorting Sidings to Immingham Dock Nordic. During the course of Saturday 60062 was named Stainless Pioneer. In charge of one of the demonstration runs 35028 Clan Line is at the top of the climb and almost at the end of the headshunt by Europa Link on 15th.June. 60040 The Territorial Army Centenary and newly named 60062 Stainless Pioneer work 6D03, 1600 Tinsley Sorting Sidings to Immingham Dock Nordic past Bessemar Way, Rotherham.